Burnout Paradise Party brings the social fun of Burnout Paradise into an offline environment where friends can pass the pad to play competitively. There are dozens of quick-fire, turn-based challenges where players compete in different stunt, speed and skill events. 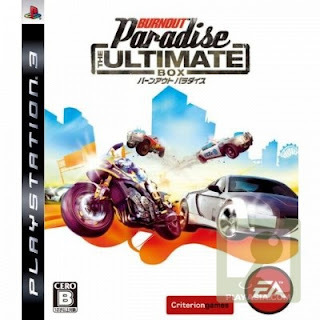 In addition to Burnout Paradise Party, Burnout Paradise The Ultimate Box will include a host of new features including a restart option added for racing, easier control of the early vehicles, and for the PLAYSTATION®3 computer entertainment system the new Burnout™ Paradise Network. Burnout Paradise Network is another Burnout Paradise social innovation that enables players to keep track of friends and keep up with all the latest Burnout news from either inside or outside the game.